These reduced-fat cookies are moist, plump, and chewy, and are the perfect way to sandwich a scoop of vanilla ice cream. Once they're individually wrapped, they can be stocked away in the deep freeze for later, when they're fun to pass around the picnic table. You can also use store-bought ice cream, and you can make them slightly more fancy by coating the sides with toasted coconut or crushed roasted sliced almonds. In a large bowl, mix together the flour, oats, brown sugar, coconut, baking soda, and salt. Mix in the raisins. Add the water, melted butter, and honey, and stir until the dough comes together. If necessary, use your hands to knead the dough until it's smooth. Bake for about 18 minutes, rotating the baking sheets midway during cooking, until the cookies are golden brown and feel slightly firm. Remove from oven and cool completely. 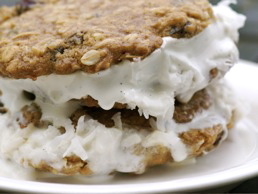 Sandwich ice cream between two cookies, making sure the tops of the cookies face outward. I find ¼ to ⅓ cup of ice cream per cookie is just right, but you can fill them as much or as little as you wish. Wrap each individually in plastic wrap and freeze until ready to serve.